Although the mechanism of retrotransposition is not completely understood, it is clear that at least two enzymatic activities are utilized. One is an integrase, which is an endonuclease that cleaves at the site of integration to generate a staggered break (Fig. 9.17). The other is RNA-dependent DNA polymerase, also called reverse transcriptase. These activities are encoded in some autonomous retrotransposons, including both LTR-retrotransposons such as retroviral proviruses and non-LTR-retrotransposons such as LINE1 elements. Figure 9.17. Transposition via an RNA-intermediate in retrotransposons.LINE1, or L1 repeats are shown as an example. The RNA transcript of the transposable element interacts with the site of cleavage at the DNA target site. One strand of DNA at the cleaved integration site serves as the primer for reverse transcriptase. This DNA polymerase then copies the RNA into DNA. That cDNA copy of the retrotransposon must be converted to a double stranded product and inserted at a staggered break at the target site. The enzymes required for joining the reverse transcript (first strand of the new copy) to the other end of the staggered break and for second strand synthesis have not yet been established. Perhaps some cellular DNA repair functions are used. The model shown in Fig. 9.17 is consistent with any RNA serving as the template for synthesis of the cDNA from the staggered break. However, LINE1 mRNA is clearly used much more often than other RNAs. The basis for the preference of the retrotransposition machinery for LINE1 mRNA is still being studied. Perhaps the endonuclease and reverse transcriptase stay associated with the mRNA that encodes them after translation has been completed, so that they act in ciswith respect to the LINE1 mRNA. Other repeats that have expanded recently, such as Alurepeats in humans, may share sequence determinants with LINE1 mRNA for this cispreference. Clear evidence that retrotransposons can move via an RNA intermediate came from studies of the yeast Ty-1elements by Gerald Fink and his colleagues. They placed a particular Ty-1element, called TyH3under control of a GALpromoter, so that its transcription (and transposition) could be induced by adding galactose to the media. They also marked TyH3with an intron. After inducing transcription of TyH3, additional copies were found at new locations in the yeast strain. When these were examined structurally, it was discovered that the intron had been removed. If the RNA transcript is the intermediate in moving the Ty-1element, it is subject to splicing and the intron can be removed. Hence, these results fit the prediction of an RNA-mediated transposition. They demonstrate that during transposition, the flow of Ty-1sequence information is from DNA to RNA to DNA. 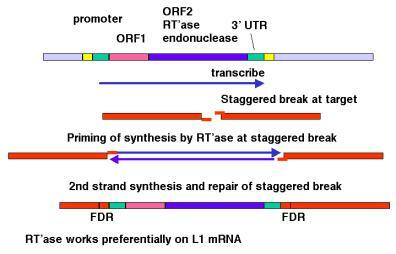 If yeast Ty-1 moved by the mechanism illustrated for DNA-mediated replicative transposition in Fig. 9.13, what would be predicted in the experiment just outlined? Also, would you expect an increase in transposition when transcription is induced?